Spring garlic, sometimes referred to as “green” garlic is immature bulbs before the scape forms. It has a mild garlic taste and does not require peeling. Scape Pesto is the perfect compliment to this soup, (we freeze pesto from the previous season), but any pesto will do. 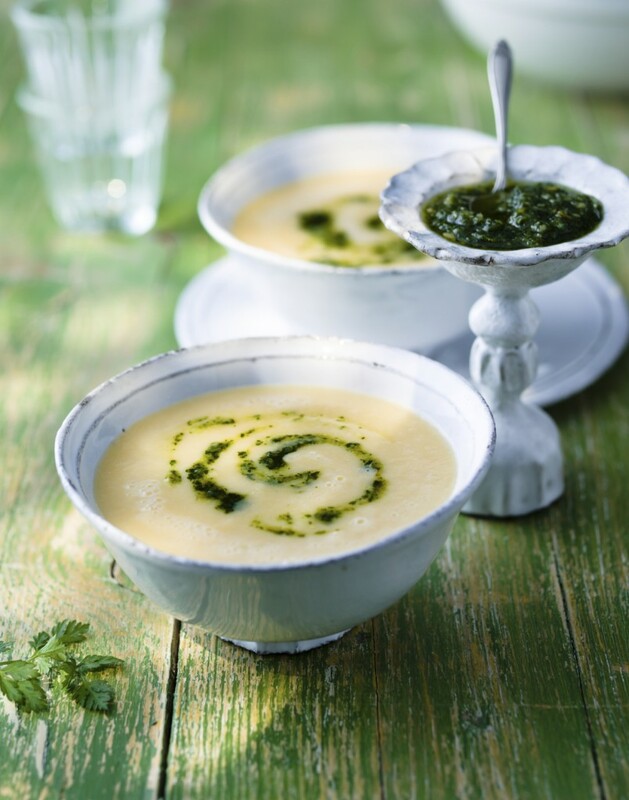 This soup is spring in a bowl! Garlic Scape Pesto: Place all ingredients in food processor and puree adding 1 tsp. more liquid at a time to desired consistency. Keeps air tight in fridge for 1 week. 1) Melt butter in soup pot over medium heat. Add spring garlic (or leeks) and sauté for 3 minutes or until softened. Add garlic and asparagus for another 2 minutes. Add potato (is using to thicken soup) and cook until it begins to soften. 2) Add stock and bring to a boil. Reduce heat to medium-low and simmer 10-15 minutes or until vegetables are soft. Season with salt and pepper. 3) Puree soup in blend until smooth. 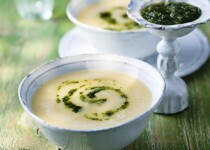 4) Return to soup pan and add cream, heating gently.Pour soup into bowls and garnish with pesto.